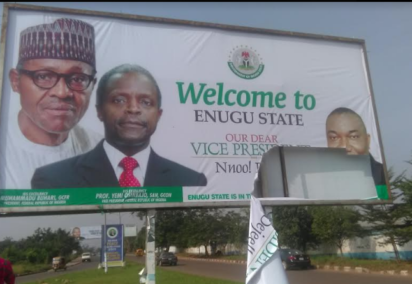 ABA—Abia State Commissioner of Police, Mr. Chris Ezike , has said that major political parties in the state are guilty of destruction of political party candidates’ billboards. He accused politicians in Abia state of hiring thugs to destroy opponent’s campaign billboards and warned that police would not tolerate the situation to avoid breakdown of law and order. “They are all guilty across board. They employ miscreants to go in the wee hours to remove posters and destroy billboards.The major political parties are guilty across the board but I would not want talk about that now because we have a meeting of Abia state Consultative Committee on Election tomorrow and after that we will address the press,” he said. “We are going to talk about that because the meeting will be on pre, post and the elections proper. There are so many activities before, after and during the election, the campaigns, rallies, processions, all of them have their rules and regulations and does not allow for violence and thuggery. “The rules are clear. Nobody has the right to destroy anybody’s billboards, or engage in violence and thuggery,” he said. The CP stated that two matters bothering on campaign billboards destruction in Ohafia and Isiala Ngwa South and Isiala Ngwa North council are under Police investigation. He explained that the one in Umuahia was resolved because it had to do with Abia State Signage Agency for regulating advertising and another one linked to Indigenous People of Biafra, IPOB. Ezike said that the issue of destruction of billboards would be addressed at the state consultative meeting on election , stressing that criminals would not claim ignorance of the law.